Democrats: Liberals, or Anti-Semitic Big-Government Bullies? Dennis Prager has clearly delineated the differences between liberals and leftists. The most fundamental is that liberals pursue freedom, while leftists strive to control every aspect of human life. If you doubt this, check out the “Green New Deal.” Using the excuse of “saving the planet,” leftists lust to control where we live, what we eat, how we travel, where we work, how much we earn, where we set the thermostat ‒ and anything else they can think of. Here is the key difference: Liberals seek to allow us the freedom to unleash our potential. Leftists seek to rule us by convincing us that only they have the ability to save the planet, or conquer fascism, or rescue us from whatever threat they conjure up today. Tomorrow there will surely be a new threat they claim to save us from. But with due respect for Prager, who has contributed so much to our understanding of leftism, I beg to differ. I believe people and groups have a right to define themselves. ● Apologists for terrorism claim that violent extremists do not represent “true Islam.” But when the “Supreme Leader” of Iran nods approvingly as the crowd chants “Death to America” and “Death to Israel,” the words of the apologists ring hollow. When the leading imams of Saudi Arabia and the leading professors of Al-Azhar University in Cairo condone terrorism, the words of the apologists are seen to be badly mistaken at best, and dishonest at worst. And when terrorist after terrorist shouts, “Allahu akbar!” the apologists seem dangerously naïve. ● Apologists for mainstream religion claim that openly leftist clergy do not represent “true Christianity” or “true Judaism.” But when Pope Francis calls unrestricted capitalism “the devil’s dung,” the apologists seem misguided. And when the pope criticizes President Trump by saying that building walls instead of bridges is “not Christian” and is not “in the Gospel,” one has a right to ask which Gospel he is referring to ‒ Matthew, Mark, Luke, John, or Karl? When the leader of a religion defines it as indistinguishable from socialism, who am I to dispute him? Leftist “progressives” work to overturn much of Judeo-Christian civilization and usher in Marxism. If such people now call themselves “liberals,” I can’t stop them. If that is the way they define themselves, who am I to disagree? In effect, they have redefined liberalism. They have debased that noble word until it has become indistinguishable from leftism, or socialism, or Marxism, or statism, or Big Brotherism, or now even anti-Semitism. I disagree vehemently, but there is nothing I can do about it. The Democratic Party, the party of my parents and my youth, has deteriorated into socialism and anti-Semitism. When a Democratic member of Congress voices blatant Jew hatred, her Democratic colleagues cannot muster up the courage to condemn her by name, or even to condemn anti-Semitism specifically. Instead, they merely condemn all intolerance. This Democratic Party is very far from the Democratic Party of my parents and my youth. It may not be much of an exaggeration to ask: What do you call a party that combines state control of many aspects of life, silencing of opposing opinions, and Jew hatred? True, this is only the embryonic stage. But what will we be forced to call it if it is allowed to grow larger? 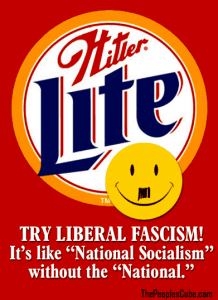 Yes, I mean National Socialism. I mean the NSDAP, the National Socialist German Workers’ Party. Replace “German” with “American,” and you begin to see what I mean. Am I using hyperbole to make a point? Am I a hysterical alarmist? You tell me. But the time to pull the fire alarm is when we first smell smoke, not when the entire structure is in flames. I consider myself a classical liberal, which is now called “conservative.” I am a John Fitzgerald Kennedy Democrat. He was deeply anti-communist, built a strong national defense, was a decorated veteran of a war against totalitarianism, and lowered taxes to stimulate the economy. If he returned from the dead, he would be called far-right, or alt-right, or whatever epithet was in vogue. But despite his faults, Kennedy loved America and worked to make it stronger. I wish current Democrats could say the same. Am I saying that most Democrats are anti-Semitic? Of course not. But I am saying that associated with its sharp left turn, the Democratic leadership has welcomed with open arms flagrant anti-Semites who spout Jew hatred that could be taken verbatim from neo-Nazi websites. And I will remember that on November 3, 2020. I have many faults, but a poor memory is not among them.